In her latest book, Asianfail: Narratives of Disenchantment and the Model Minority, Eleanor Ty, professor of English and Film Studies at Wilfrid Laurier University, explores how a new generation of Asian-Americans and Asian-Canadians struggle with their parents' expectations of a life defined by economic status and professional success. The Asian Pacific American Librarians Association (APALA) awarded Ty's book the 2017-2018 Asian Pacific American Award for Literature in the adult non-fiction category. In Asianfail, Ty studies films, literature, and graphic novels that contest the normative scripts of Asian identity. Continuing her important work in Asian North American literary studies, Ty shows that literary works explore how second-generation Asian-Americans and Asian-Canadians have differing aspirations and dreams than what is expected of them by their first-generation parents. "Literature is expressing how second-generation Asian North Americans do not feel the urgency to establish themselves only in the world of finance and corporate markets. Storytellers are resisting the narrowly defined 'model minority,'" says Ty, who in her own life veered in the opposite direction of what her parents suggested. "I am inspired by writers who are articulating a different kind of dream," says Ty. The APALA, which gives the Award for Literature to individual works about Asian/Pacific Americans and their heritage based on literary and artistic merit, says Ty's work is an essential contribution to non-fiction addressing the "model minority" myth. "I am inspired by writers who are articulating a different kind of dream." "I'm thrilled to be recognized by the public library community, which makes space for all readers and is spreading the word about a book from academia," says Ty. "I'm also grateful to be counted among such distinguished past award winners." Ty has been writing about Asian-American and Asian-Canadian literature for 18 years. 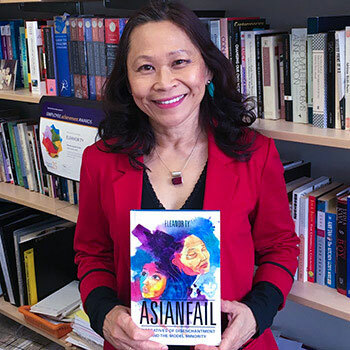 Asianfail: Narratives of Disenchantment and the Model Minority is her third book exploring this topic, which received initial funding support from a Social Sciences and Humanities Research Council (SSHRC) research grant. Among other recognitions, Ty was named Laurier's University Research Professor for 2015/16. "I am grateful to Laurier for awarding me the University Research Professor award, which gave me time and additional funding to complete the research for the book," says Ty.